This "Community Garden Guide" is intended to help Marin communities, neighborhood groups and organizations along the path to starting and sustaining a community garden. Those who are lucky enough to have sunny backyards or balconies can plant a garden whenever they have the time and energy. But what about those who do not have a place to garden? For these people, community gardens may be the answer. Many families without adequate space to garden at home would like to grow their own fresh fruits, vegetables, herbs, as well as flowers, while saving money on their food bills. And for many, gardening is a relaxing way to exercise and enjoy being outdoors. There are also families who would like to grow traditional foods not available in the supermarket, while offering an opportunity to pass along cultural gardening practices to younger generations. Community gardens beautify neighborhoods and help bring neighbors closer together. They have been proven as tools to reduce neighborhood crime--particularly when vacant, blighted lots are targeted for garden development. Community gardens provide safe, recreational green space in urban areas with little or no park land, and can contribute greatly to keeping urban air clean. There is a lot of work involved in starting a new garden. Make sure you have several people who will help you. Survey the residents in your neighborhood to see if they are interested and would participate. Hold monthly meetings of the interested group to develop and initiate plans, keep people posted on the garden's progress, and keep them involved in the process from day one. The typical garden committee has at least two officers: a president and a treasurer; although your garden may have more if necessary. Elections for garden officers usually are held annually. Look around your neighborhood for a vacant lot that gets plenty of sun--at least six to eight hours each day. A garden site should be relatively flat (although slopes can be terraced, such as San Anselmo’s community garden). Ideally, it should have a fence around it with a gate wide enough for a vehicle to enter. It is possible to work with a site that is paved with concrete or asphalt by building raised beds that sit on the surface or using containers, such as Point Reyes’ garden next to Toby’s Feed Barn. You can also remove the asphalt or concrete to create areas for gardens, but such a garden will be much more difficult, expensive, and time-consuming to start. A site without paving, and soil relatively free of trash and debris is best. The potential garden site should be within walking, or no more than a short drive from you and the neighbors who have expressed interest in participating. If the lot is not already being used, make sure the community supports establishing a garden there.It's best to select three potential sites in your neighborhood and write down their address and nearest cross streets. If you don't know the address of a vacant lot, get the addresses of the properties on both sides of the lot--this will give you the ability to make an educated guess on the address of the site. We suggest you identify at least three potential sites because one or more might not be available for you to use for various reasons, and you want to end up with at least one that works out. It is illegal to use land without obtaining the owners permission. In order to obtain permission, you must first find out who owns the land. Take the information you have written down about the location of the sites in step 3 to your county's tax assessor's office. The Marin County Tax Assessor's office is located at the Civic Center’s county offices: 3501 Civic Center Dr # 208, in San Rafael. At this office, you will look through the map books to get the names and addresses of the owner of the sites you are interested in. While you are researching site ownership, contact your local water district to find out if your potential site(s) has/have an existing water meter. Call their customer service department, and ask them to conduct a "site investigation". They will need the same location information that you took with you to the Tax Assessor's office. Existing access to water will make a critical difference in the expense of getting your project started. Depending on the size of your garden site, you will need a 1/2-inch to 1-inch water meter. If there has been water service to the site in the past, it is relatively inexpensive to get a new water meter installed (if one doesn't already exist). If there has never been water service to that site, it might cost much more for your water provider to install a lateral line from the street main to the site and install your new meter. Once you have determined that your potential site is feasible, write a letter to the landowner asking for permission to use the property for a community garden. Be sure to mention to the landowner the value of the garden to the community and the fact the gardeners will be responsible for keeping the site clean and weed-free (this saves landowners from maintaining the site or paying city weed abatement fees). Establish a term for use of the site, and prepare and negotiate a lease. Typically, groups lease garden sites from land owners for $1 per year. You should attempt to negotiate a lease for a least three years (or longer if the property owner is agreeable). Many landowners are worried about their liability for injuries that might occur at the garden. Therefore, you should include a simple "hold harmless" waiver in the lease and in gardener agreement forms. Landowners of potential garden sites might be concerned about their liability should someone be injured while working in the garden. Your group should be prepared to offer the landowner a lease with a "hold harmless" waiver. This "hold harmless" waiver can simply state that should one of the gardeners be injured as a result of negligence on the part of another gardener, the landowner is "held harmless" and will not be sued. Each gardener should be made aware of this waiver and should be required to sign an agreement in order to obtain a plot in the community garden. Landowners may also require that your group purchase liability insurance. The role of liability insurance is to protect the organization, or individual land owner from legal action on the part of another. It protects gardeners or volunteers indirectly only if the insured organization or individual landowner stands between them and a potential lawsuit. It does not protect individuals from legal action, nor does it necessarily pay individuals for injuries or damage that occur at a garden. Most gardens have insurance because they have an organization to protect or because some other entity requires coverage in order for the garden to exist. Just as group health insurance is much less expensive than individual coverage, insurance purchased by a larger organization to cover a multitude of risks will be less expensive per coverage than the same insurance purchased piecemeal. Typical organizations providing insurance might include community groups, churches, and/or horticultural/agricultural organizations. If you are approaching the city/town about a parcel of land, check and see what their town ordinances say regarding community gardens. All towns usually have a "risk manager" whose job is to protect the municipality against all types of risk. Whenever the town enters into a relationship, that relationship is passed before the risk manager. It is not uncommon for the risk manager to say "buy insurance". If the town wants to support community gardening, the risk and associated cost is relatively minor; if the town doesn't want to support community gardening, it is easier to say "buy insurance" than "you’re not our priority." If this is the case, consider looking into local organizations that can provide insurance. If that is not a viable option, you may still inquire about insurance coverage through a local carrier that may be able to offer low annual rates. Taking care of insurance is one of the main obstacles to overcome in establishing a garden. Once you have a lease signed by the landowner and liability insurance, you're free to plan and plant your garden! Community members should be involved in the planning, design, and set-up of the garden. Before the design process begins, you should measure your site and make a simple, to-scale site map. Hold two or three garden design meetings at times when interested participants can attend. Make sure that group decisions are recorded in official minutes, or that someone takes accurate notes. This ensures that decisions made can be communicated to others, and progress will not be slowed. A great way to generate ideas and visualize the design is to use simple drawings or photos cut from garden magazines representing the different garden components--flower beds, compost bins, pathways, arbors, etc.--that can be moved around on the map as the group discusses layout. At least 15 plots assigned to community members. These should be placed in the sunniest part of the garden. Without plots for individual participation, it is very difficult to achieve long-term community involvement. It is advisable to have the soil at the site tested for fertility, pH, and presence of heavy metals. Contact a lab to have this completed for a nominal fee. Raised bed plots, which are more expensive, should be no more than 4 feet wide (to facilitate access to plants from the sides without stepping into the bed), and between 8 and 12 feet long (it is advisable to construct your raised beds in sizes that are found in readily-available lumber, or that can be cut without too much waste). NOTE: The lumber should not be treated with any dyes, stains, paint or other applications. In-ground plots can be from 10 x 10 up to 20 x 20 feet. Pathways between beds and plots should be least 3 to 4 feet wide to allow space for wheelbarrows. The soil in both raised bed and in-ground plots should be amended with aged compost or manure to improve its fertility and increase its organic matter content. A simple irrigation system with one hose bib or faucet for every four plots. Hand watering with a hose is the most practical and affordable for individual plots (and it's almost a necessity when you start plants from seed). Drip and soaker-hose irrigation can be used in all areas of the garden for transplanted and established plants, but especially for deep-rooted fruit trees and ornamentals. If no one in your group is knowledgeable about irrigation, you might need some assistance in designing your irrigation system. Seek out a landscape contractors, nursery or garden center professionals, and/or consult the Marin Master Gardeners for consultation to help you develop a basic layout and materials list. An 8-foot fence around the perimeter with a drive-through gate. Fencing will help keep deer from decimating your hard work. The gate must be large enough to accommodate the occasional introduction of vehicles or heavy equipment, as needed. A tool shed or other structure for storing tools, supplies, and materials. A bench or picnic table where gardeners can sit, relax, and take a break--preferably in shade. If there are no shade trees on the site, a simple arbor can be constructed from wood or pipe, and planted with chayote squash, bougainvillea, grapes, kiwis, or some other vine. Designate an area for youth where they can participate in the garden, learn, and play. A sign with the garden's name, sponsors, and a contact person's phone number for more information. If your community is bilingual, include information in this language. A shared composting area for the community gardeners. Wood pallets are easy to come-by and (when stood on-end, attached in a U-shape, and the inside covered with galvanized rabbit-wire) make excellent compost bins. A small fruit tree orchard, whose care and harvest can be shared by all the members. The orchard can also create shade for people as well as shade-loving plants. A water fountain. This can be a simple drinking fountain attachment to a hose bib (or faucet) you can purchase at a hardware store. Perimeter landscaping, which can focus on drought tolerant flowers, shrubs and plants that attract bees, butterflies, hummingbirds and other pollinators. Also, these bushes, such as roses and other flowers are suitable for cutting bouquets. Herbs are also well-suited to perimeter landscaping and help suppress unwanted pests. A meeting area, which could range from a semi-circle of hay bales or tree stumps, to a simple amphitheater. Building a shade structure above would be beneficial as well. A community bulletin board where rules, meeting notices, and other important information can be posted. Use your design to develop a materials list and estimate project costs. You will need to call-around to get prices on fencing and other items. A community garden with just the basic elements (listed above) typically costs between $2,500 to $5,000. It is rarely possible to foresee every need during the planning phase. If you find you have extra resources beyond the bare minimum, it is advisable to hold some in reserves, to be spent as the garden begins to operate and funding needs make themselves apparent. Tapping into neighborhood resources, such as community members with carpentry, irrigation, landscape design, or other skills can help curb costs. Utilizing recycled materials rather than purchasing new items can also help keep budgets under control. While some start-up funds will be needed through determination and hard work, you can obtain donations of materials for your project. Potential sources of funding for things from lumber to plants include community businesses, local non-profits, and foundations. Develop a letter that tells merchants about your project, why it's important to the community, and how their support of your garden could make their business look good to the local community. Attach your "wish list" as examples of things you’re looking for, but keep in mind that modest requests are more likely to be met. Try to personalize this letter for each business you approach. Drop it off personally with the store manager, then follow-up by phone. Be patient, persistent, and polite. Your efforts will pay-off with at least some of the businesses you approach. Be sure to thank these key supporters and recognize them on your garden sign, at a garden grand opening, or other special event. Money, which will be needed to purchase items not donated, can be obtained through community fund-raisers such as car washes, craft and rummage sales, pancake breakfasts, and bake sales. They can also be obtained by writing grants, but be aware grant writing efforts can take six months or longer to yield results, and you must have a fiscal sponsor or agent with tax-exempt 501(c)3 status (such as a church or non-profit corporation) that agrees to administer the funds. If you have not yet formed a garden club, now is the time to do so. It's also time to establish garden rules, develop a garden application form for those who wish to participate, set up a bank account, and determine what garden dues will be if these things have not already been done. This is also the time to begin having monthly meetings if you have not already done so. Also, if you haven't already contacted your city councilperson, he or she can be helpful in many ways including helping your group obtain city services such as trash pick-up. Their staff can also help you with community organizing and soliciting for material donations. Many new garden groups make the mistake of remaining in the planning, design and fundraising stage for an extended period of time. There is a fine line between planning well and over planning. After several months of the initial research, designing, planning, and outreach efforts, group members will very likely be feeling frustrated and will begin to wonder if all their efforts will ever result in a garden. That's why it's important to plant something on your site as soon as possible. People need to see visible results or they will begin to lose interest in the project. To keep the momentum going, initiate the following steps even if you are still seeking donations and funds or your project (but not until you have signed a lease and obtained insurance). Schedule community workdays to clean up the site. How many work days you need will depend on the size of the site, and how much and what kind of debris are on site. Without water, you can't grow anything. So get this key element into place as soon as possible. There are plenty of opportunities for community involvement--from digging trenches to laying out pipes. Once you have water, there are many options for in-garden action. Stake out beds and pathways by marking them with stakes and twine. Mulch pathways. If your fence isn't in yet, some people might still want to accept the risk of vandalism and get their plots started. You can also plant shade and fruit trees and begin to landscape the site. If you do not yet have a source of donated plants, or don't wish to risk having them vandalized, plant annual flower seeds which will grow quickly and can be replaced later. Continue to construct the garden as materials and funds become available. At this point, your ideas and hard work have finally become a community garden! Be sure to take time to celebrate. Have a grand opening, barbecue, or some other fun event to give everyone who helped to make this happen a special thank-you. This is the time to give all those who gave donated materials or time a special certificate, bouquet, or other form of recognition. Be sure to invite the local media as well; every new garden that brings community together and beautifies the neighborhood is naturally newsworthy and will help build interest in other communities. Most gardens experience occasional vandalism. The best action you can take is to replant immediately. Generally the vandals become bored after a while and stop. Good community outreach, especially to youth and the garden's immediately neighbors is also important. Most important--don't get too discouraged. It happens. Get over it and keep going. What about barbed wired or razor wire to make the garden more secure? Our advice--don't. It's bad for community relations, looks awful, and is sometimes illegal to install without a permit. If you need more physical deterrents to keep vandals out, plant bougainvillea or pyracantha along your fence, their thorns will do the trick! Invite the community officer from your local precinct to a garden meeting to get their suggestions on making the garden more secure. Community officers can also be a great help in solving problems with garden vandalism, drug dealers, and/or gang members in the area. Clear and well-enforced garden rules and a strong garden president can go a long way towards minimizing misunderstandings in the garden. But communication problems do arise. It's the job of the garden club to resolve those issues. If it's something not clearly spelled out in the rules, the membership can take a vote to add new rules and make modifications to existing rules. Language barriers are a very common source of misunderstandings. Garden club leadership should make every effort to have a translator at garden meetings where participants are bilingual. Family members of those within the multi-lingual gardening community can be invaluable where language barriers exist. It's important to get your compost system going right away, and get some training for gardeners on how to use it. If gardeners don't compost, it is possible large quantities of waste will begin to build up in a relatively short period of time. In addition to promoting pest problems within the garden, excess waste can be an eyesore, a fire hazard, and could hurt your relationships with neighbors and the property owner. Make sure gardeners know how to sort trash properly, what to compost, and what to recycle. Trash cans placed in accessible areas are helpful to keep a neat and tidy garden. 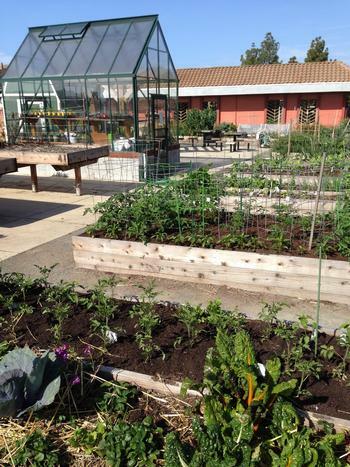 There has been, and probably always will be, a high rate of turnover in community gardens. Often, people sign up for plots and then don't follow through. Remember, gardening is hard work for some people, especially in the heat of summer. Be sure to have a clause in your gardener agreement which states gardeners forfeit their right to their plot if they don't plant it within one month, or if they don't maintain it. While gardeners should be given every opportunity to follow through, if nothing changes after several reminders (preferably by letter), it is time for the club to reassign the plot. If you find that your garden may have extra plots available, consider conducting a community outreach campaign aimed at churches and other groups in the neighborhood to let them know about the garden and that plots are available. Gardeners tend to visit their plots less during the winter time, and lower participation, combined with rain, tends to create a huge weed problem in January, February, and March. Remember, part of your agreement with the landowner is that you will maintain the lot and keep weeds from taking over. In the late summer/early fall, provide gardeners with a workshop or printed material about what can be grown in a fall and winter garden. Also, schedule garden workdays for the spring in advance since you know you'll need them at the end of winter to clear weeds. If you anticipate that plots will be untended during the winter, apply a thick layer of mulch or hay to the beds and paths to reduce weed proliferation. This guide is intended to provide support and information for current community gardeners and those interested in community gardening in Marin County. Community gardening is more than residents growing plants on a piece of land; it is a chance to build community relationships, pass on cultural practices, grow food, and beautify neighborhoods. The guide outlines some of the key areas needing special attention, such as securing land, water, and insurance. These three components are some of the most critical components for the initial development for gardens as we found in our community garden assessment of Marin County. Therefore, it is important to first build momentum with prospective gardeners and non-gardening neighbors alike to ensure everyone understands a garden plan is being proposed for the neighborhood and the intended outcomes. Once the neighborhood residents are on board, the next critical steps are to secure a plot of land that has water access. This can most easily be accomplished by visiting your county’s tax assessor office. Acquiring liability insurance will be in the interest of land owners. Insurance may be provided by organizations such as include community groups, churches, and/or horticultural/agricultural organizations. There are of course many considerations to address when establishing a garden, but we feel the aforementioned—community buy in, locating land with water, and acquiring liability insurance—are ideal foundations for starting a community garden. Special thanks to the Los Angeles County Master Gardeners for their willingness to permit our adaptation of their manual for use here in Marin.